Apparently EVA Unit 06 has a halo on its head and it doesn’t require external power supply. It is highly possible that it represents an Angel rather than EVA series. Within the trailer we can see the lying grey EVA Unit 08, which is quite badass. I believe it will release before the EVA 3.0 movie itself. 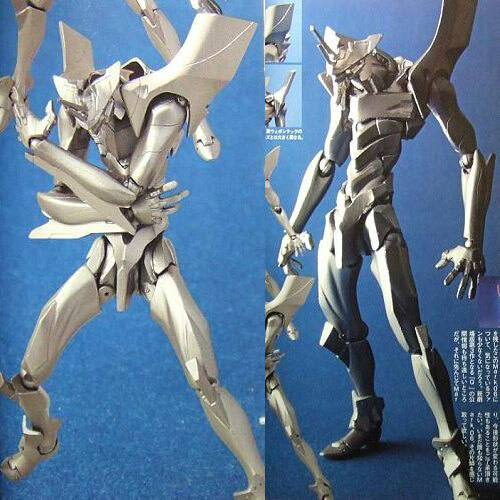 Kaiyodo Revoltech No.76 Evangelion 01 (awaken), No. 77 Evangelion 05 (temp) and No. 78 Dancouga. Kaiyodo Revoltech Expo 2009! Arbalest & Transformable Valkyrie! Revoltech Expo 2009, Fully Transformable Revoltech Valkyrie?! I haven’t watch any of the Evangelion anime/OVA/movie – but it seems to be very popular and someday if I can find the original DVD, I will surely grab them all….